Monologues for teens or young women, comedic with a serious message! World peace, world peace. Everyone wants world peace. Or everyone pretends to want world peace. But they don’t really want world peace. Because there’s a simple way to get it. Everyone knows it, no one wants to say it. Fire the boys. Fire the boys! There. I said it. The boys have been mostly in charge of the world for a long time now, and look at it. The world is a mess. A mess created by boys. And why are we surprised by this? Go into any single boy’s home or apartment or dorm room. Go into it. Is it tidy? Are the pants crisply folded, the shirts carefully hung, the socks darned? Some? Sure, sure. Some are. But the majority? The majority are a forgotten wasteland of dirty laundry, empty beer cans and old pizza boxes! So what idiot saw the average boy’s room and said, “This looks good! We should put this guy in charge of the entire world! I think he’ll get the place in order!” I can tell you this, it wasn’t a girl. A girl did not make that decision. No, boys have been putting other boys in charge for a long time now. And yeah, we girls get some middle management positions, a few leadership roles here and there. Things are changing. But meanwhile, the boys really are still mainly in charge. And really, if they knew what is good for them, they’d all step down and let some ladies step up right away. And I know, boys, what you’re thinking “What makes you think you’d do better!” And my answer is, wild baboons! Wild baboons have proved that girls can do better. Let me explain. There’s a troupe of wild baboons in Africa, you can Google this, where a tragedy killed off most of the males, leaving all the girl monkeys in charge. And the result was AMAZE-BALLS. The baboons stopped fighting amongst themselves, and spent more time socializing and grooming each other. Making them less mean and more clean! And it was good for the boys! The boy monkeys who used to be all stressed out, worrying about competing with the other boys , learned from the now dominant girl culture how to groom each other. In no other baboon troupe does one male monkey groom another. These secure guy monkey’s do! The girls taught them that! And when new boys come into the troupe, they teach them how to do it too. And they’ve kept this monkey utopia going for generation after generation! And the result is healthier boy monkeys! The scientist who studies them – Dr. Sapolsky – found these monkeys have none of the stress related issues of regular monkeys. Regular monkeys, especially the lower status ones that get picked on all the time, have the same problems we do - high blood pressure, obesity, and impaired brain function from stress. But Sapolksy’s monkey’s don’t, no – they’re thriving like no other troupe. So boys, if you know what’s good for you – you will step down right now and let the girls take over. Not only will it be good for your individual health, it will be good for the entire world! 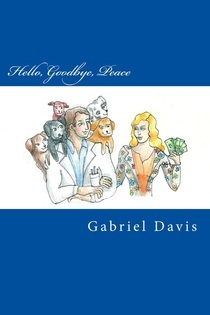 ​This monologue is from the play Hello, Goodbye, Peace available in digital and print editions here.